Continued growth in mature medical and recreational markets, legalization in new states and further development of recently launched MMJ and rec industries will be the primary drivers of growth for the U.S. marijuana industry over the coming years. But legal sales represent just a fraction of the estimated total potential demand for cannabis in the United States, which is around $50 billion-$55 billion, including black-market demand. This is how much revenue the industry could generate if the federal government legalized marijuana nationwide. 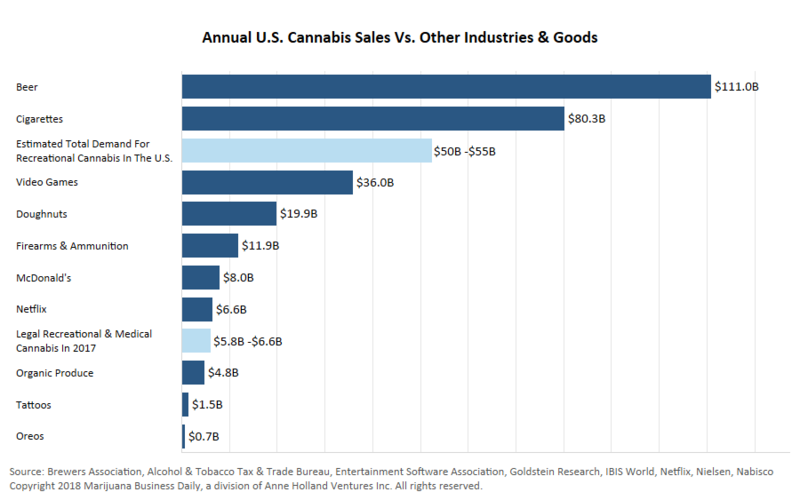 Relative to more traditional goods like cigarettes and beer, sales of cannabis on an annual basis are quite small. The marijuana industry, however, is on a very different growth trajectory than cigarettes and beer, with legal sales expected to grow more than 200% from 2017 to 2022. This has caught the attention of alcohol and tobacco companies, as two major players from these industries – Constellation Brands and Alliance One International – recently made significant moves into the cannabis space. Though marijuana’s status as a federally illegal substance creates uncertainty in the short term and will likely keep most mainstream companies on the sidelines, the tremendous potential for growth means the long-term outlook for the U.S. cannabis industry is bright. how can i invest my money in u.s. marj. companies.? You’d have to privately invest directly with a cannabis company since it’s not federally legalized and doesn’t post on the exchange (other than the occasional penny stock-which is a huge risk). If you’re still interested you may want to reach out to groups like 420 Investor or the like for help.